I have found Children’s Eucharistic Adoration a great gift for our parish. One of the images that stays in my mind from it is seeing the children from second class in their little huddle in the sanctuary before the Lord Jesus present in the Blessed Sacrament. This is their quiet time when they kneel and bow down before Jesus with eyes closed as they listen to Jesus in their hearts and bring their prayers to Him. It is a touching scene. The line from scripture that comes to me when I think of this is where Jesus says – ‘Let the little children come to me, do not stop them, for it is to such as these that the Kingdom of God belongs’. What is coming to me is Jesus saying to us as He said to the disciples – do not do anything that stops or blocks the children from coming to me. It strikes me that the children are so open to God and in particular to Jesus’s Real Presence in the Eucharist that, in a sense all we have to do is facilitate this encounter. He wants to speak to their hearts. 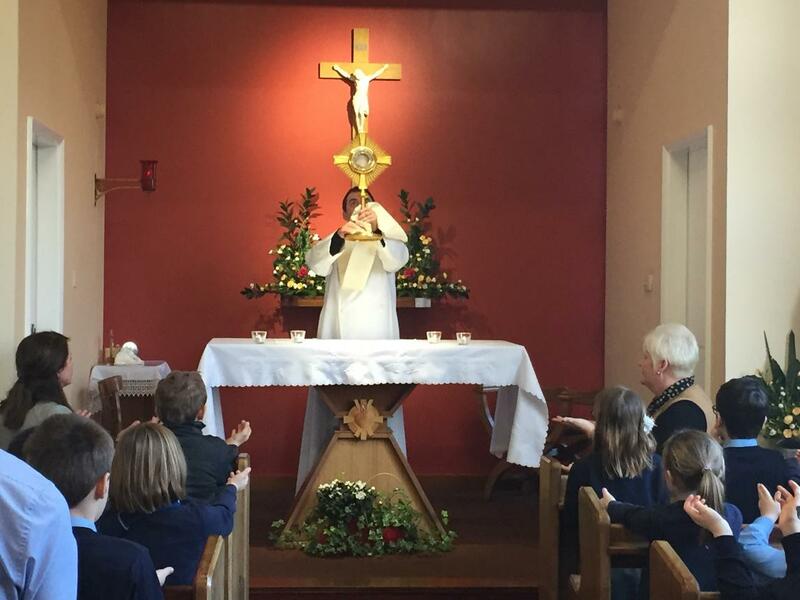 Another picture that is coming to me is when on the occasion of the death of a young boy in our parish the whole school community – children, teachers staff gathered in the school, the priest brought the Blessed Sacrament and Antoinette and Aoife led us in a beautiful time of prayer. Despite the sadness – all were touched and consoled. I and I believe many others felt the presence of the Lord in that time of great sadness. I am delighted to have the Children of the Eucharist programme here in St. Mary’s Parish Creggan. Our post first communion children are enabled to deepen their faith in the years between first confession/communion and confirmation. The Children of the Eucharist facilitates the introduction of children to Adoration of Jesus in the Blessed Sacrament in a way that is simple, engaging and uses bible stories. It helps us all, children and adults, to listen to Jesus in his word and adore his presence in the Eucharist. It has a simple format, prayerfully composed, designed to allow Jesus to touch the hearts of children so as to help them to experience the enormity of His love for them. The few days you spent in my parish were incredibly blessed. It was wonderful to witness both staff and children encountering Jesus in the Blessed Sacrament through your gentle guidance. I sensed that seeds were sown in their hearts which by the grace of God will produce an abundant harvest in their lives and our community. Thank you for your generosity and your obvious love for Jesus which shines through your ministry. We are delighted with such a gift for our Primary four children. They have benefited so much from your presence and bringing Christ’s presence into the classroom in a very special way. The teachers in our six primary schools in the parish are over the moon with the programme and just love to see you come. Children of the Eucharist fulfils the mission of obeying Jesus, by leading our young children to spend one hour with me, opening the possibility of a personal relationship with Jesus.